UT Southwestern Medical Center offers expertise in every technique, approach, and medication available to stop – and in some cases, reverse – the devastating effects of stroke. Designated as an Advanced Comprehensive Stroke Center by the American Stroke Association and The Joint Commission, our team is recognized for providing the highest level of care available anywhere. Intravenous tissue plasminogen activator (IV tPA): This medicine for ischemic stroke can dissolve the clot causing the stroke. It can be administered up to 4.5 hours after the patient’s "last known well” (the time prior to hospital arrival at which the patient was last known to be without the current stroke’s symptoms). It is crucial for patients to get help immediately to have the best chance for recovery. Endovascular rescue therapy: The newest treatment for major strokes, endovascular rescue therapy removes the blood clot that’s causing the stroke. 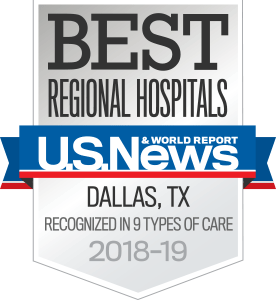 UT Southwestern was among the first hospitals in the country to offer this treatment, years before it was confirmed as the standard of care in 2015. UT Southwestern also offers advanced neurosurgical care for cerebrovascular disorders such as brain aneurysms, brain vascular malformations, carotid artery disease, and other cerebrovascular disorders that could be the underlying cause of a stroke. Learn more about stroke risks.